Beards are seen as sacred and as a defining feature of the Æsir in ancient texts such as Konungsbók Eddukvæða. In addition, beards are likewise traditionally associated with men and masculinity throughout Norse history, as highlighted in Íslendingasögur (Icelandic Sagas), including the very significant Njáls saga, but also Eyrbyggja saga as well as Færeyinga saga and Völsunga saga. Beards are further even historically protected by law under Jónsbók, Grágás and Guta Lag. Overall, beards are an essential and fundamental defining feature of any Norðmaðr, Víkingr, Heathen, and ultimately, warrior’s identity. The beard is the one characteristic of those who otherwise follow Forn Siðr (Old Ways). Beards are in fact the true expression of spirituality, masculinity, and what it means to be Heathen. Beards define the Heathen man. 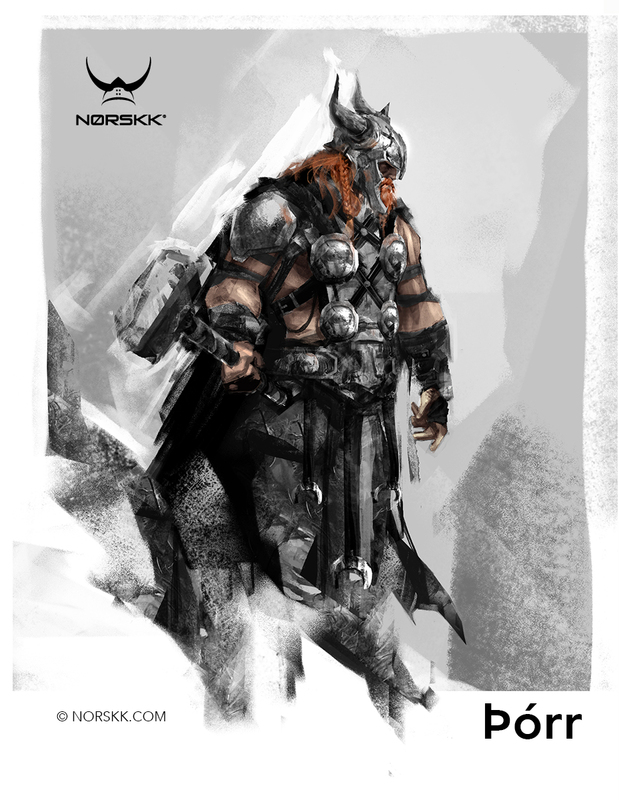 A distinct and defining feature of the Æsir (also known as the Norse gods) is their beard. All Norse gods, but one, are described in traditional and sacred texts, as well as illustrated throughout Norse history, as sporting a beard: Baldur (Beauty), Bragi (Poetry, music, harp), Forseti (Justice), Heimdallr (Guardian of Ásgarðr), Hermóðr (Messenger of the Æsir), Höðr (Darkness, winter), Hœnir (Silence, Óðr), Meili (Son of Óðinn), Móði (Anger) and Magni (Strength), Óðinn (Ássinn), Óðr (Spirituality, poetry, passion, battle frenzy, and sexual ecstasy), Þórr (Battle, thunder, men), Týr (War, skies), Ullr (Archery), Váli (Revenge), Vé (Creation/wisdom), Villi (Creation/will), and Víðarr (Forest, revenge, silence). A notable exception is Loki (Mischief, lies). Loki is the least favorite of all Æsir, and a Norse god typically associated with negative behavior as well as the dark side of humans. Loki is is known to have wrecked havoc among the Æsir, even being responsible for the death of some of them, including Baldur. Loki is also known for having turned himself into a mare in order to be impregnated by the stallion Svaðilfari, eventually giving birth to Sleipnir, Óðinn’s 8-legged horse. An event greatly frown upon in a culture that emphasizes gender polarization and strongly stigmatizes feminization of men. From any perspective therefore, Loki is the very opposite of what a man should strive to be. Loki also happens to be the only Norse god without a beard. Therefore emphasizing the association between beard and manly virtues in Norse culture. Numerous references in Konungsbók Eddukvæða, the most sacred text in Norse culture and religion, actually reinforce the association between beards and masculinity as well as virtue. In Atlakviða (The Lay of Atli) specifically, a direct association is made between beards and warriors, with stanza 34 stating “Long-bearded, bold, the warriors entered”. In stanza 11, another connection is made between beard and wisdom, reading “The wolf shall rule the Niflungs' heritage, O bearded sages”. From an Æsir and traditional Norse god perspective, a beard is therefore always associated with masculinity and virtue, including moral strength, manliness, valor, excellence, and worth, while the absence of a beard expresses feminization as well as depravity and immorality. Possibly the most significant Íslendingasaga in Norse history and culture is Njáls saga. This Icelandic saga not only encompasses all the fundamental and essential Norse values that form the basis of Forn Siðr, but the saga has also established the foundation of Icelandic culture for the past millennium. A main character in Njáls saga is Gunnar Hámundarson. A man known for his physical prowess, his masculine virtue, and of course, his beard. A man who encompasses so well what it means to be a Norðmaðr, that his name, Gunnar, is now one of the most common and revered names in Iceland and other Nordic countries. From the perspective of Íslendingasögur, the ancient texts that provide us with such great insight into traditional viking life and thus Forn Siðr, a Norðmaðr is not considered worthy, or even a man, if he doesn’t have a beard. As with the Æsir perspective, a beard is again always associated with masculinity as well as the value that form the foundation of Forn Siðr. The importance of beards as a defining feature of Norðmenn is also very well expressed in medieval Norse laws, including Guta Lag (The Law of the Gotlanders). In addition, Section 19/25-30 uses beards as a point of reference for an offense, “causing a scar on the face between hat and beard”, resulting in specific penalties, half a mark in silver or a mark in silver if the scar is very noticeable. This points yet again to the prevalence of beards in Norse culture. The fact that specific offenses relating to beards were codified under the law, and that such offenses could also be deemed insults to a man, reinforces the importance of beards in Norse culture and history, and more specifically, as a foundation for Forn Siðr. Forn Siðr (Old Customs) is very different from Abrahamic religions or faiths. For us Norðmenn, Víkingar, and Heathens, Forn Siðr represents our truth, our ancestors, our culture, our identity, our knowledge, our masculinity, and our spirit. Forn Siðr is what makes us men and our own man, taking our own decisions, and taking our own responsibilities. In fact, we do not pray or worship per say the Æsir, Ásynjur, Vanir, Jötnar, Aðrir, Kindir, or Kynja. This is because the Norse gods are seen as our ancestors, they are ideals we strive to achieve, they are ourselves, they are us. They are our religion. They are our soul. As such, we can only honor them, and be one with them, if we share similar characteristics, in virtues and behvaior, but also in appearance and traditions, including by sporting a beard. The beard is and has always been a defining feature of being Heathen, and a religious symbol of Forn Siðr. In fact, the beard is a religious symbol of Forn Siðr or Heathenry as much as the kippot is a religious symbol of Judaism, or the beard and the pagri are a religious symbol of Sikhism. 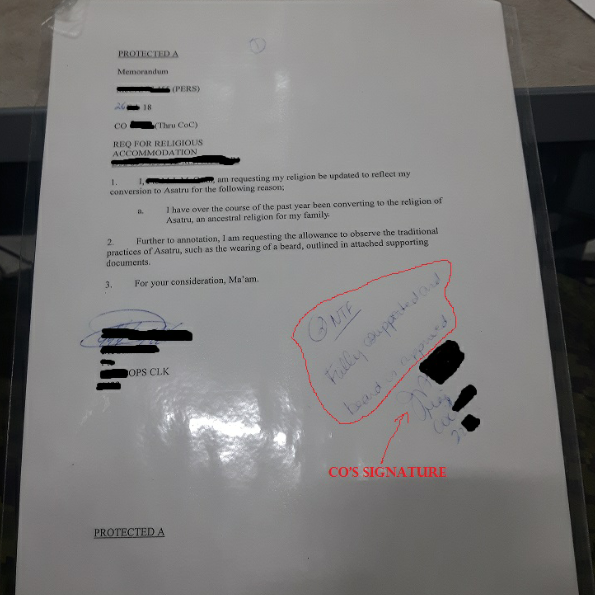 Army Directive 2018-19 (Approval, Disapproval, and Elevation of Requests for Religious Accommodation): Issued 8 November 2018, tightening process, and transferring authority to approve religious accommodations from Commanding Officer level to GCMCA level.